its seasons of quiet growth and maturing. The Christian's version of "New Year's Day" is the First Sunday of Advent, when we begin again the entire cycle of the year. Advent begins four Sundays before Christmas and ends on Christmas Eve. Even as the secular culture around us blares its songs of reindeer and tinsel, as if Christmas were already here, the Christian calendar sets aside four weeks of quiet preparation. Advent has a two-fold character: as a season to prepare for Christmas when Christ's first coming to us is remembered; as a season when that remembrance directs our mind and heart to await Christ's second coming at the end of time. Advent thus is a period of devout and joyful expectation. A Holy Day of Obligation in the United States, this is the day on which we celebrate the Immaculate Conception of the Virgin, the conception of Mary in the womb of her mother. This feast intensifies our preparation during Advent, remembering how God prepared for Christ's birth by creating Mary free form original sin at conception. What makes her conception immaculate is not that she was conceived by the Holy Ghost of a virgin, as was Christ Our Lord, but that from the very moment of her conception, she was filled with grace by God, Who knew, in His omniscience, that she would say "yes" to the Angel Gabriel and become the Mother of the Savior. Chosen by God, Mary reverses the sin of Eve. Because of her obedience, God's Salvation is made know to all the nations. Next to the yearly celebration of the paschal mystery, the church holds most sacred the memorial of Christ's birth and early manifestations. 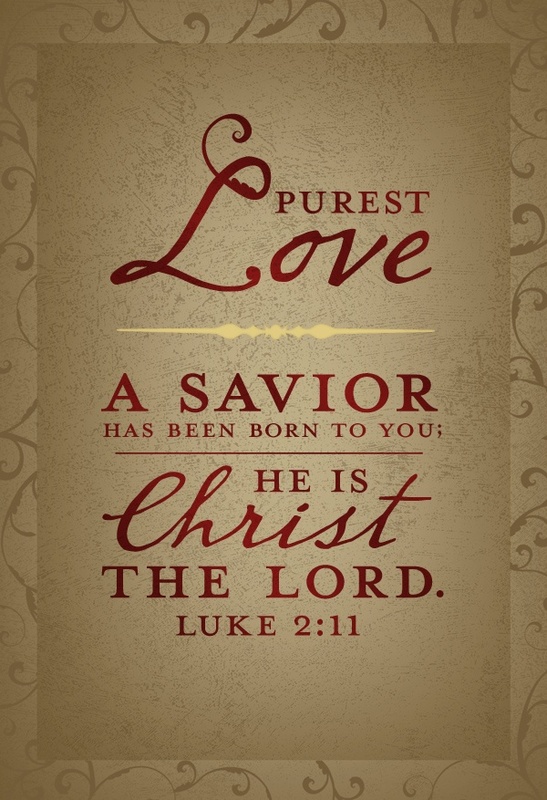 This is the purpose of the Christmas season which typically begins with a worship service or a Vigil Mass on Christmas Eve and ends on the Feast of the Baptism of the Lord on the Sunday after January 6. The Feast of the Nativity is a most joyous one that celebrates the incredible reality that the Second Person of the Trinity was born of a Virgin. The mood is summed up by Luke 2:14, "Glory to God in the highest: and on earth peace to men of good will." Formerly it was celebrated on the Sunday after Epiphany, but since 1969 the feast falls on the Sunday after Christmas, or December 30 if Christmas falls on a Sunday. This Feast is celebrated after Christmas because in Old Testament Law, a child wasn't a son of Abraham or a true part of the family until his circumcision at 8 days of age, an event of Christ's life that we celebrated on January 1 (from December 25 to January 1 are 8 days). On this Holy Day of Obligation, we focus on the divine motherhood of Mary whom we proclaim to be the mother of Christ and the mother of the Church. We seek God's blessings as did Mary. Because of her Son, we can confidently call God, "Abba"! This is a great and very important Feast remembering the journey of the three wise men, Caspar, Melchior and Balthasar, who followed the star that showed all nations and peoples that Jesus was sent by God for all. Epiphany has become the day we traditionally bless our homes and families. The three wise men, Caspar, Melchior and Balthasar followed the star of God's Son who became man two thousand and eight years ago (write 20 + CMB + 15 over the door with chalk). Bless, O Lord, this household and family, and allow all of us who live here to find in it a shelter of peace and health. Make our house a haven for us all and a place of warmth and caring. May all who come and go through here know that Christ both dwells and enters here. We pray through Jesus Christ our Lord, Amen. From the front door, the family may process through the house, blessing each room with water (an evergreen sprig may be used). Singing verses of "We Three Kings" may be added to make the procession through the house more festive. Ordinary Time is celebrated in two segments: from the Monday following the Baptism of Our Lord up to Ash Wednesday; and from Pentecost Monday to the First Sunday of Advent. This makes it the largest season of the Liturgical Year. This first installment of Ordinary Time has anywhere from four to nine Sundays, depending on how early or late Easter falls in a given year. Its season's focus is Jesus' manifestation of Himself as God during His public ministry. Easter falls on the first Sunday after the first full Moon that falls on or after March 21 (not, as commonly believed, the first Sunday after the first full Moon in Spring). The earliest possible date for Easter is March 22, and the latest possible date for it is April 25. This season, also called "Quadraegesima," meaning "Forty," is a somber, penitential Season lasting from Ash Wednesday to the Thursday before Easter. It recalls Christ's 40 days in the desert, and the Israelites' wandering in the desert for 40 years. Per the everyday calendar, Lent lasts 40 days plus the six Sundays, but the Sundays aren't counted as "Lent" because Sundays are always about the Resurrection and are joyous. The annual Lenten season is the fitting time to climb the holy mountain of Easter. The Lenten season has a double character, namely to prepare both catechumens and faithful to celebrate the paschal mystery. The catechumens, both with the rite of election and scrutinies, and by catechesis, are prepared for the celebration of the sacraments of Christian initiation; the faithful, ever more attentive to the word of God and prayer, prepare themselves by penance for the renewal of their baptismal promises. This season prepares all of us for the celebration of Easter, the most important feast of the Church year. 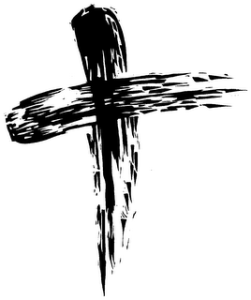 Ash Wednesday marks the beginning of our Lenten journey towards Easter and eternal life. Now truly is our time to be healed and reconciled to God and to one another. The mark of ashes on our foreheads reminds us of our sinfulness and our turning back to God for forgiveness, healing and mercy. The ashes are made by the burning of palms from last year's Palm Sunday -- palms that were waved in victory and praise. After the priest sprinkles the ashes with holy water and incenses them, he puts them on our foreheads in the shape of a Cross to remind us of our hope, and as he does so, he says the words of Genesis 3: Remember, man, that thou art dust, and unto dust thou shalt return. We make no response to these words; we simply return to our pews. After we leave the church, we leave the ashes on our foreheads until they wear off naturally from the course of the day's activities. They are a public witness to those things our society does not wish to embrace: the reality of death, and the hope of resurrection in Our Lord, Jesus Christ. Ash Wednesday and Good Friday are days of Fast and Abstinence - limit of one full meal and two smaller meals for persons 18 through 59 years of age; no meat for persons 14 years of age and older. All Fridays during Lent are days of Abstinence - no meat for persons 14 years of age and older. 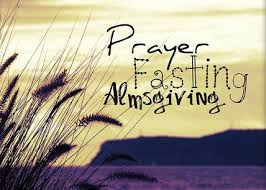 There is no obligation to fast during the weekdays of Lent. However, voluntary acts of self-denial are encouraged. Stations of the Cross will be held each Friday afternoon of Lent at 7:00pm and 6:00pm on Good Friday. 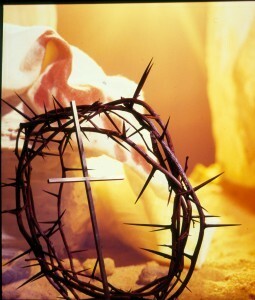 Please come pray and reflect on our Lord's passion and its meaning for Catholics. All are welcome. This is the last two weeks of Lent, from Passion Sunday (the 5th Sunday of Lent) to the day before Palm Sunday. The second week of Passiontide is called "Holy Week." The last three days of Holy Week -- i.e., Maundy Thursday, Good Friday, and Holy Saturday -- are called the Sacred Triduum. Palm Sunday commemorates the triumphal entrance of Christ into Jerusalem (Matthew 21:1-9), when palm branches were placed in His path, before His arrest on Holy Thursday and His Crucifixion on Good Friday. Christ redeemed us all and gave perfect glory to God principally through his paschal mystery: dying he destroyed our death and rising he restored our life. Therefore, the Easter Triduum of the passion and resurrection of Christ is the culmination of the entire liturgical year. These are not three separate liturgical celebrations but one which takes three days to celebrate. Thus, the solemnity of Easter has the same kind of preeminence in the liturgical year that Sunday has in the week. The Easter Triduum begins with the Evening Mass of the Lord's Supper, reaches its high point in the Easter Vigil, and closes with evening prayer on Easter Sunday. The Mass of the Lord's Supper features the distinctive action of the Washing of the Feet, just as the Lord did for his disciples and we do for one another. It is the first, the longest, the most grim, and the starkest day of the Triduum. On this day, we confront the truth that the impassible God suffered, that the ever-living God died. We confront the dark fact that He did so for our sins. Several ethnic groups have kept alive the tradition of blessing food on Holy Saturday. The staples for the Easter Sunday meal (or, in some cultures, the Saturday vigil meal) - bread, wine, the colored eggs, the ham - are all placed in a basket and brought to the church to be bless. The high point of the liturgical year! This moving liturgy consists of The Service of Light, Liturgy of the Word, Baptism of new Christians and renewal of Baptismal vows, and the Eucharist takes place after nightfall on Holy Saturday. The third and consummating rite of the RCIA process, the Sacraments of Initiation, also takes place at the Easter Vigil on Holy Saturday. The Elect culminate their long journey to initiation in the waters of Baptism -- then, with the candidates, the newly baptized are sealed with the oil of Confirmation and share the bread and wine of the Eucharist as full members of the Roman Catholic community. Easter Sunday is a day all about seeking. The early hristian communities gathered around the Apostles, seeking more about the life and ministry of the Lord Jesus. Saint Paul told the baptized Colossians to "seek what is above." Mary of Magdala went to the tomb, seeking to find the Lord's body so that she could anoint it. We come to church on Easter Sunday, seeking many things. For some of us, this is a once-a-year journey, when we seek connection with the foundations of the Christian faith. For others, this day is the culmination of a long journey of Lenten repentance. For the newly baptized, this is the first day of a new life filled with promise and expectation. Whatever it is that we seek, let us be inspired by the disciple whom Jesus loved who, when he saw the wrappings of cloth inside the empty tomb, "saw and believed." ©Copyright, J.S. Paluch Co.
Easter Day is certainly the most important day of the church year. The celebration of Easter begins during the Easter Vigil after nightfall on Holy Saturday, continues through Easter Sunday and into the Easter season, a full 50 days, until Pentecost (the day that the Holy Spirit was given to the Church). The Great 50 Days of Easter are a wonderful opportunity to explore and celebrate Easter more fully than we can possibly squeeze into a single day. These fifty days can be a time of learning to live the way of Easter in our everyday experience. This Holy day of Obligation, 40th day of Easter, commemorates Christ's Ascension into Heaven from Mount Olivet 40 days after He rose from the dead (Mark 16:14-20) . After the Gospel is sung, the Paschal Candle, lit from the New Fire of the Easter Vigil, is extinguished to symbolize the departure of Christ. Many dioceses in the United States celebrate the Ascension on Sunday following rather than on Ascension Thursday. Also known as "Whitsunday," Pentecost is the second greatest Feast of the liturgical year -- the first being Easter -- and takes place 50 days (7 weeks) after Easter. 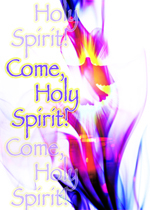 The fiftieth day after Easter, this day celebrates the coming of the Holy Ghost upon the disciples and Our Lady, and is regarded as the crowning close to the Easter season. This day is considered a sort of "birthday" for the Church. The second part of Ordinary Time begins after the Easter Season, on the Monday after Pentecost, and ends on the Saturday before the First Sunday of Advent and is devoted to the mystery of Christ in all its aspects. This Season's focus is the Holy Spirit in the Millennium, the Church Age that we now live in, and Christ's Reign as King of Kings -- the time between the Age of the Apostles and the Age to Come. The first Sunday after Pentecost, Trinity Sunday celebrates the Christian doctrine of the Trinity, the three persons of God: the Father, Son, and Holy Spirit. 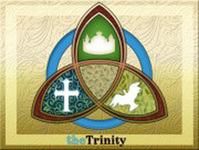 Trinity Sunday also represents the beginning of the Church part of the liturgical year, continuing until Advent. As on Maundy Thursday, we celebrate the Body of Christ -- but this time without the sense of impending doom of knowing what would come on Good Friday. This feast has an interesting history. Its inspiration is due to two things: the first is the Miracle of Bolsena, which happened in A.D. 1263. Peter of Prague, a German priest, during a pilgrimage to Rome, stopped at the Church of St. Christina there to offer Mass. While he was a holy and devout man, he harbored doubts about the Real Presence -- doubts which were completely resolved when the Host he consecrated during that Mass began to bleed. He rushed to meet Pope Urban IV in Orvieto, bringing the Host with him. The miracle was declared, and the Host is still on display at the Cathedral of Orvieto today. The second source of inspiration was an Augustinian nun, a Belgian named St. Juliana of Mont Cornillon (A.D. 1193-1258). She had a vision of the Moon that was full and beautiful, but marked by a black spot that signified that there was no joyous celebration of the Eucharist in the entire Church calendar. Because she belonged to Christ, Mary, our queen, is raised on high, a great sign for all who believe in her Son. On this day, a Holy Day of Obligation, we recall Our Lady's being assumed into Heaven and crowned Queen. The Feast of St. Francis of Assisi. Everyone is encouraged to bring their pets for this special blessing in honor of our patron saint of animals. This is a Holy Day of Obligation on which we celebrate the Church Triumphant -- all the Saints in Heaven, canonized or unknown. Let us rejoice in all the men and women, blest in the eyes of the Lord, who celebrate the heavenly liturgy. They stand in God's holy place and sing of the love the Father has bestowed upon them through the blood of the Lamb. During the entire month of November we remember in a special way all those parishioners and loved ones who have passed away during the past year. 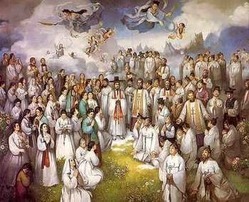 The Feast of All Saints is November 1 and the Feast of All Souls is November 2. These two feasts at the beginning of November stress the reality of death, resurrection, punishment, or reward. On the Monday nearest to the Feast of All Souls, the parish typically holds a special remembrance for all of our deceased parishioners. On this day, we pray for the conversion of all to Christ, and for all governments to recognize Him as King and conform their laws to His teachings. This is the only way to peace! Thanksgiving Day Liturgy will be on Thursday, with a 9:00 a.m. Mass. We come to give thanks for our many blessings in this seasonal tradition.